What Difference Does a C14 Lab’s Turnaround Time Make? Choosing a radiocarbon dating laboratory is not always easy; there are many factors to consider and often budgetary constraints to negotiate. An important factor in decision-making is how quickly the results are reported, particularly if there are deadlines to meet. Even when there is no impending deadline, a fast turnaround time can be important and lead to cost savings in the long run. 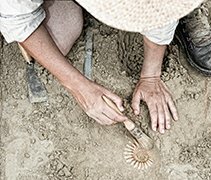 Being able to get radiocarbon dating results while still in the field can inform and direct an ongoing excavation strategy. Whether surprising or expected, the results allow the limited time in the field to be utilized most efficiently, either by suggesting a change in approach or supporting the current plan. This allows cost savings in the long term as the excavation strategy can be adjusted on the go as needed, ensuring the best use of time and funds and avoiding repeat trips to the field, which can be extremely expensive. Even if not in the field, waiting months for radiocarbon dating results can be detrimental to research and post-excavation work. While publication deadlines can provide a clear-cut need to prioritize a fast turnaround time, it is worth considering what difference a 14 business-day turnaround time can make even without a specific deadline. Obtaining a chronological framework early on based on radiocarbon dating can direct the research strategy from the outset, therefore keeping a project on track and making the most efficient use of invaluable research time. Further analyses and other lines of evidence can be pursued in a timely manner, which prevents the need for any rush fees or last minute additional fieldwork. Having results available early therefore helps save money as well as time. One option that is only possible with fast turnaround time is sending samples in batches; this can be beneficial particularly if there are unexpected results. Once the results for the first batch are reported, the decision can be made on whether to proceed with the rest of the samples immediately, date smaller batches or rethink and consult other lines of evidence first. Priority samples, such as those from a clear stratigraphic context, could be dated first as a starting point to gauge the reliability of the remaining samples while giving preliminary indications of the chronology of the site. ISO 17025-accredited Beta Analytic provides fast, high-quality radiocarbon dating services. There are several turnaround time options available ranging from 3 to 14 business days. To help make the most of limited budgets, Beta Analytic has removed cancellation fees for samples that are too small for dating after pretreatment and offers complimentary stable isotope analysis for bones, carbonates and water samples. For samples that needs pretreatment, the turnaround time is 14 business days. For samples that do not need pretreatment, results are reported in 7 business days. The Miami-based lab has price lists in most major currencies including USD, EUR, GBP, INR, JPY, KRW, RMB and TWD. To request for a quotation, please indicate the service requested (AMS dating standard or priority service or stable isotope analysis), the type of material (e.g. wood, charcoal, sediment), the number of samples and the billing address of the paying institution. For inquiries, please use the lab’s contact form or call a local forwarding office. This entry was posted on Monday, August 21st, 2017 and is filed under Uncategorized .